Speakers at the ABC USD’s Day of Remembrance events include (from left) Bill Shishima, Min Tonai, Kanji Sahara, Mike Hatchimonji, Iku Kiriyama, Hel Keimi, Jason Fujii. Not pictured: Joyce Okazaki, Marvin Inouye, Nancy Oda, Grace Hatchimonji. 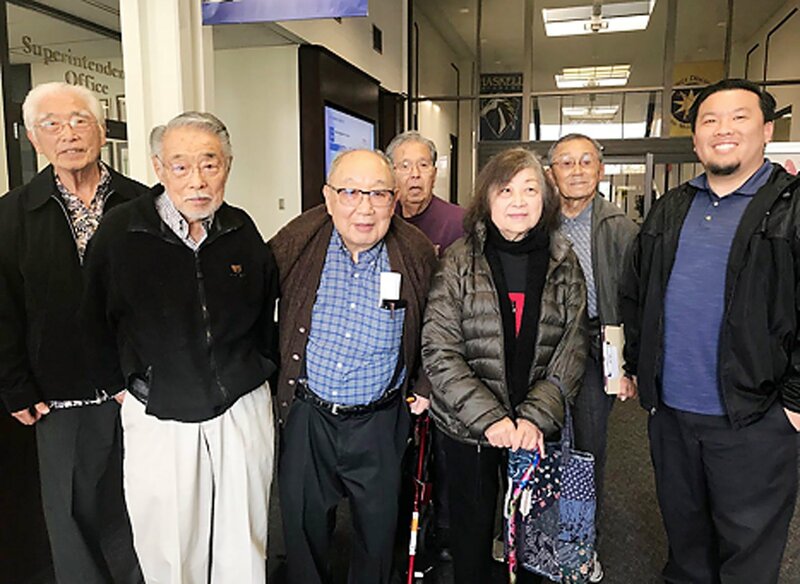 On Feb. 19, 20, 22, and 26, nine survivors of the American concentration camps during World War II will be giving testimony of their experience to the students of the ABC Unified School District. The annual Day of Remembrance observance is a reminder of President Franklin Delano Roosevelt’s Executive Order 9066, signed on Feb. 19, 1942, which incarcerated almost 120,000 Americans of Japanese descent. These American concentration camps were located inland in places like Manzanar and Tule Lake in California, Poston and Gila River in Arizona, and Amache in Colorado. The Day of Remembrance event will be conducted all day at each of the various high schools and will include a short introductory video, art, and an in-person live interview by high school students with a camp survivor. As part of the new curriculum, the students will be immersed in poetry, symbolic artifacts, and pictures of the incarceration. Items like the tag required to be worn on the individuals on evacuation day will evoke the inhumane aspect of the experience. At the end, the students should understand what it means to be separated from family, what it means to be stripped of civil rights, and how conceptions of “rights” change during a crisis. “It is an important civics lesson that needs repeating now in a time that we seem to be forgetting our basic civil rights,” said a Whitney High School teacher. Although Day of Remembrance events occur in various Japanese American cultural centers, the ABC DOR will reach out to a broader age and cultural range of people who may be unaware of the camps. According to Iku Kiriyama, terminology is important. “‘Camp’ to most young people sounds like a fun summer camp but for young adult and older Japanese Americans it was anything but fun.” Deprived of possessions, liberty and basic dignity, many felt the scars of the experience well after the war. ABC USD serves the cities of Artesia, Hawaiian Gardens, most of Cerritos, and portions of Lakewood, Long Beach, and Norwalk.